One of the cuisines that Betsy and I frequently choose when we rarely go out to eat is sushi. It’s just really hard to reproduce good sushi at home and I also love watching sushi chefs work. It’s truly an art. 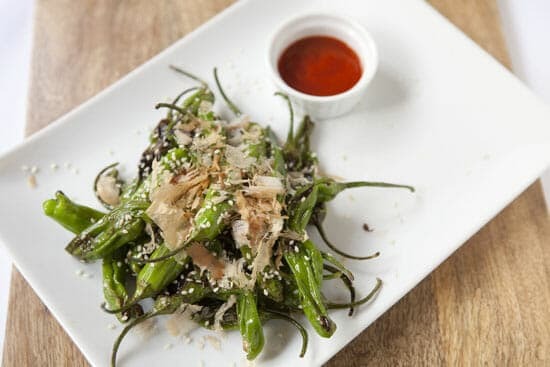 I like to get some edamame as an appetizer when we go out for sushi but recently I’ve been obsessed with these little charred peppers: shishito peppers. 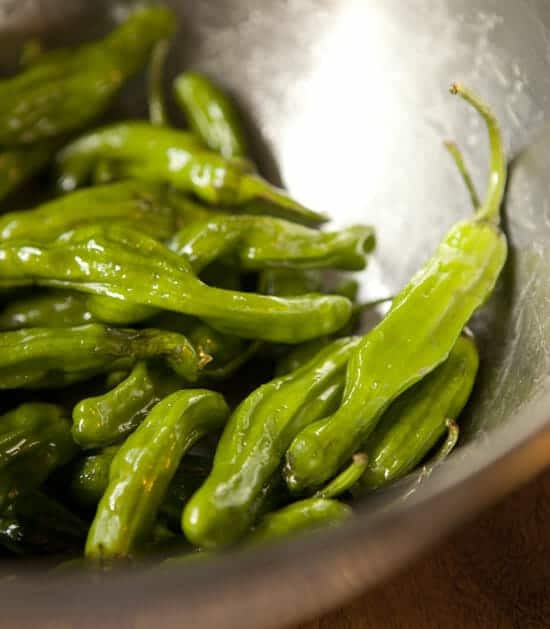 They are spicy, but not super spicy, and usually served with some fun toppings and spicy/savory dipping sauces. I never thought to try to make them at home until I saw a big bin of the peppers at Whole Foods recently. They were cheap and so I grabbed a few handfuls and figured I would give it a shot at home. 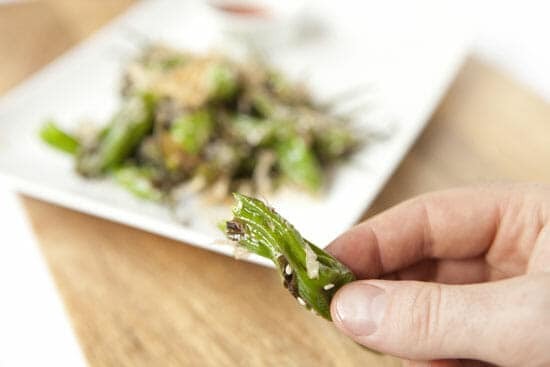 While I probably won’t get into sushi making at home anytime soon, you can bet I’ll make these Charred Shishito Peppers any time I need an appetizer for an Asian-style meal because they are insanely addictive and take just a few minutes. Shishito peppers are cheap and delicious as a quick appetizer recipe. Here’s how to make them and what to serve with them! 1) Rinse peppers well, dry them, and toss them with both kinds of oil. 2) Get a large cast iron skillet hot over medium high heat and add in all the peppers. Be sure to turn on the fan over your stove as it might get a little smokey. 3) Let peppers char for 2-3 minutes and stir once so they are charred on all sides. 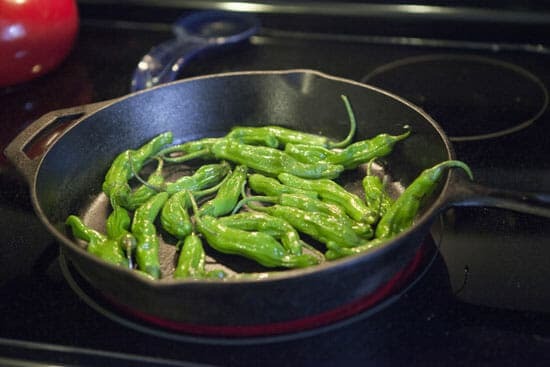 4) When peppers are lightly charred all around, remove from pan and add to a bowl. Cover with plastic wrap and let steam for 2-3 minutes. 5) Drizzle peppers with soy sauce and plate. Cover with a liberal topping of sesame seeds and bonito flakes and serve with sriracha chili sauce. These peppers aren’t really expensive, but they can be a bit tricky to find. Like I said, I happen to find some at Whole Foods, but you can probably call around to Asian grocers as well and have good luck finding some fresh ones. These peppers are mild although I found that some were fairly spicy which is fun. They also have a lot of crags so they char in random spots. When you are ready to make the Charred Shishito Peppers, rinse the peppers and dry them well and then toss them with some vegetable oil and sesame oil. You want a very light coat of oil on the peppers. Then just add the peppers to a hot cast iron skillet over medium-high heat. These will need to char for about five minutes and you should stir them a few times as they cook to make sure they are cooking evenly. One note about this is that the peppers will probably smoke a bit as they char so make sure to turn on your vent over the stove or open a few windows. You can also easily do these on the grill if you happen to be grilling. This might get a little smokey. When the Charred Shishito Peppers are done, they’ll look something like this! Once the peppers are charred, add the peppers back to the bowl and drizzle with some soy sauce. Then cover them with plastic wrap and let them steam for just a few minutes. This will soften them up a bit further. Don’t let them steam for more than a minute or two though or they will get mushy. Honestly, you don’t need a ton of toppings for these Charred Shishito Peppers because they have really nice flavor on their own, but I think these three toppings are very fun. 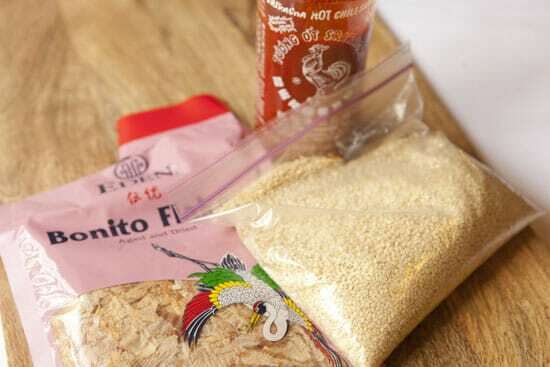 Sesame seeds and sriracha are pretty common but you may not have used bonito flakes before. Basically they are a smoked and dried fish (mackerel) that is then sliced paper thin. The flakes literally dissolve in your mouth and have a savory and smokey flavor. You can find bags of them in the Asian section of most grocery stores these days. A healthy dose of these on the peppers takes them to the next level for sure. Once the peppers are tossed with soy sauce and steamed, I just pile them high and sprinkle liberally with sesame seeds and bonito flakes. Serve with the chili sauce on the side. 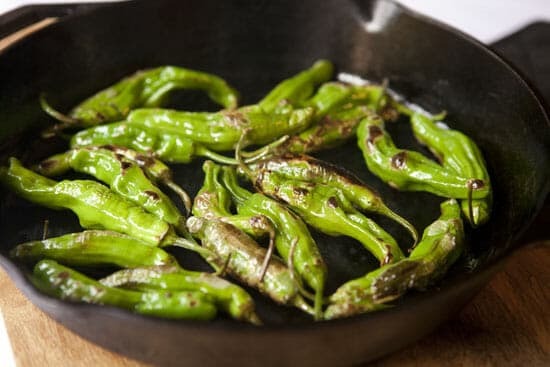 Honestly, I ate almost all of these Charred Shishito Peppers by myself, but 4-5 peppers is probably a good appetizer serving so a big plate like this will easily feed four people. 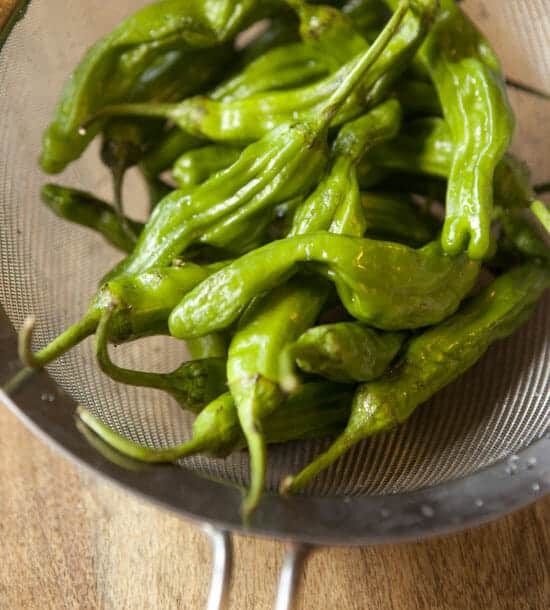 You might be a little scared to bite into a whole pepper, but trust me that they are mild and wonderful with just enough spice to get you sweating. Has anyone had these before? Am I the only one who is obsessed? Leave a comment! This looks really good and want to try but what would be a good alternative to Bonito flakes, or would the sesame seeds alone be just fine? This sounds delicious. I am definitely trying it as soon as I get to Whole Foods and find the peppers. Instructions are really clear. I am obsessed with these as well, had them for the first time recently in NYC at a Peruvian/ Asian fusion restaurant ! Hopefully I can find some at my local Asian market. 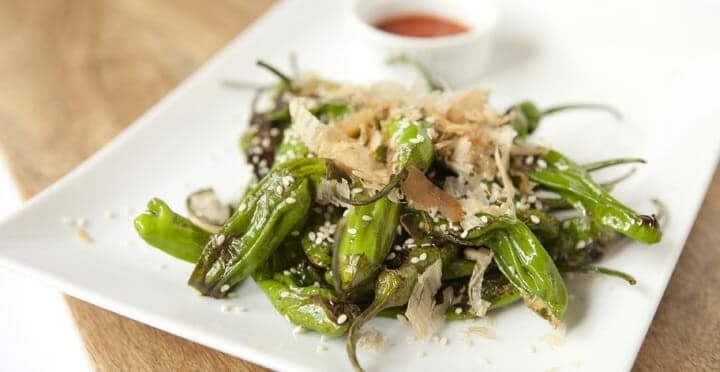 Yum yum yum – I LOVE shishito peppers. I usually just top them with lemon juice and salt, but your toppings look fantastic! Will have to try! Speaking of sushi making, you might enjoy this doc film called Jiro Dreams of Sushi. Pretty amazing! Love love love that movie. I’ve watched it a few times. So awesome to see someone so passionate about one thing. I haven’t seen these at a supermarket yet, but I saw them on a menu yesterday (Rustico 22201), so I ordered them. They were salted and served with lemon yogurt for dipping. The yogurt had black pepper and toasted mustard seeds in it. They were charred with too much oil in my opinion, but the dip was awesome. I love these so much I have 3 plants growing in my garden this summer. I have more peppers than I can eat. Cheap for whole foods is still too much $ if you are obsessed! Grow your own. Make sure you top your seedlings. You want 4 tops, I currently have a small hedge growing and have been sharing them with my wife for 3 weeks now. Probably have 2 weeks left. are prepared the same way….just add coarse salt…. Eating these at Citizens Burger in Charlottesville, Va and the drizzle a sweet soy over them! Can’t stop eating them! I’d love to make them but can’t seem to find them anywhere! We live in CT and tried Whole Foods and an Asian market. Any suggestions? Just had some tonight. Glad to find this recipe! I had these at a bar in Okinawa, Japan and have often wondered if I could ever find them again. I found them at Albertsons just today and looked here to see how to fix them. Thank you. My husband saved some of the seeds to grow. Can’t wait to see how they turn out for me. I am obsessed with them as well. Discovered them at St Petersberg Florida as an appetizer on a happy hour. I have found that they’re on many menus out here in Florida, but will be searching for these babies upon return to the Philly area. Wish me luck! 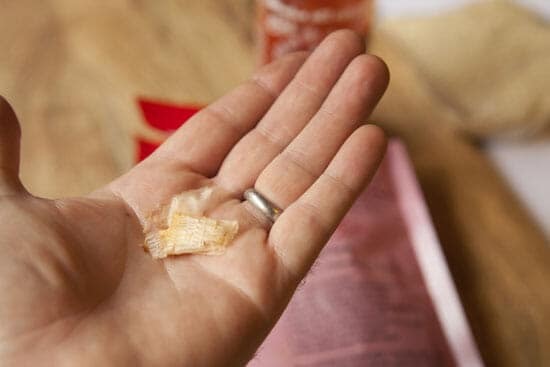 Nick – I started eating these at my favorite sushi restaurant a few years ago. They are SO addictive and my restaurants doesn’t always have them (they didn’t last night, as a matter of fact – SOB!!). Really excited to have your recipe and will have to try them soon. I’ve always had them served with coarse sea salt to “dip” then in. Have seen them at Whole Foods and Trader Joes. Just didn’t know how to fix them until your recipe appeared. Can’t wait to try them. My mouth is watering already. Made this way as my first experience with eating them. They were very tasty. I steamed with soy but ended up adding a bit of ponzu and I enjoyed the citrus kick of the ponzu with the bonito more than the plain soy. Will make again (and again, and again). Note* found the peppers at WFoods.